In a speech in Missouri, Sessions revealed he was issuing new litigation guidance that he said would “assist our Department attorneys in fighting unconstitutional orders” all the way to the U.S. Supreme Court. 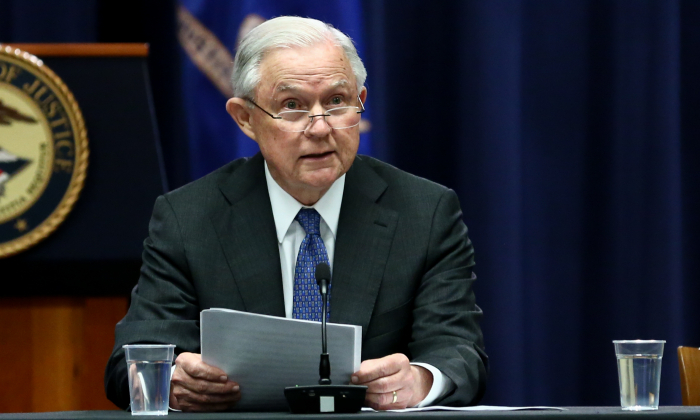 Nationwide injunctions have become a favored tool by states and other groups who have staunchly opposed many of the Trump administration’s more controversial policy initiatives. They allow a single judge in one federal district to block the implementation of new rules across the entire United States. The new guidelines call on Justice Department litigators to fight back against cases that involve nationwide injunctions. During the Obama administration, Republican-led state attorneys general and business groups often sought nationwide injunctions, a strategy that has since been more often deployed by Democratic state attorneys general and civil rights groups who seek to block many of President Donald Trump’s policies. By Sessions’ count, courts have issued nationwide injunctions 25 times since Trump took office. Among some of the most well-known examples include an injunction from a federal judge in Hawaii to block Trump’s order banning people from certain Muslim countries from traveling to the United States. Another well-known example involved three different federal district court judges who each separately blocked the Trump administration from rescinding Deferred Action for Childhood Arrivals (DACA), a program that protects from deportation some young immigrants who were brought to the United States illegally as children. “Increasingly, we are seeing individual federal district judges go beyond the parties before the court to give injunctions or orders that block the entire federal government from enforcing a law or policy throughout the country,” Sessions said in a statement that accompanied the new guidelines.